Drawing blocks shouldn't be marked as erroneous when in an arbitrary code wrapper. Changed the label from bug to suggestion, because having the bug label might tempt a quick fix like removing certain classes of contextual errors from the arbitrary code wrapper altogether. Instead this warrants a proper implementation. Actually, I think a quick fix would suffice in the meantime. 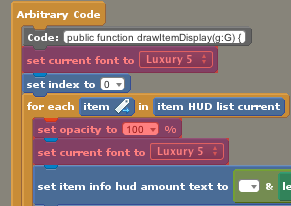 It's quite annoying to program when most of your blocks have a red overlay. The vast majority of users will never touch the arbitrary code wrapper anyway, so a robust solution solution would have little impact and a quick solution's shortfalls won't be seen by many.